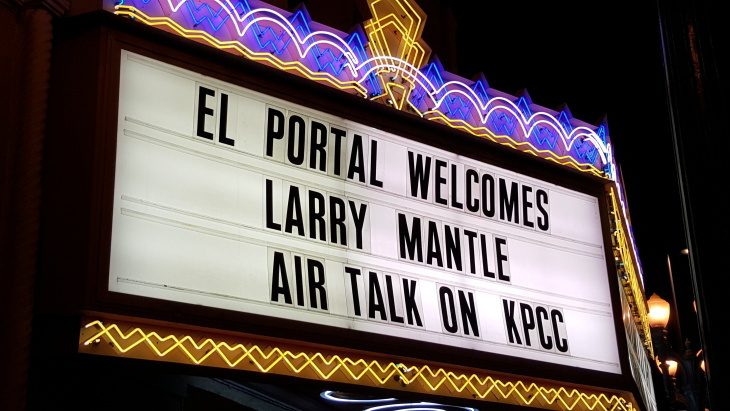 Larry Mantle and industry experts and workers discussed the impact and implementation of a $15 minimum wage hike in the City of Los Angeles at the El Portal Theatre in North Hollywood on July 7, 2015. 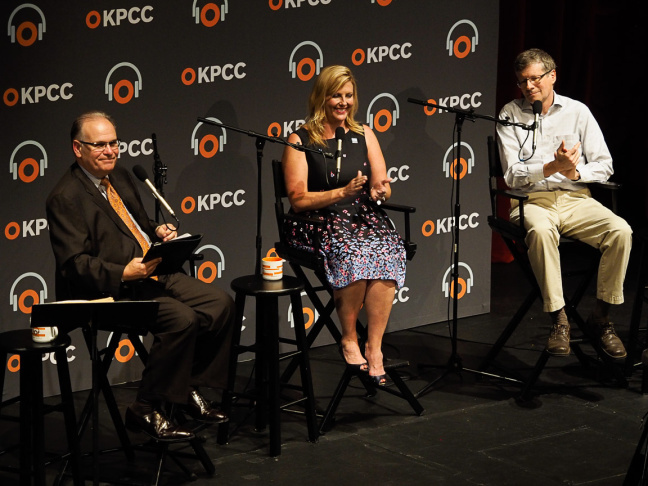 AirTalk's special event in North Hollywood on July 7 centered on the impact and implementation of a minimum wage hike in the city of Los Angeles to $15 over four years. 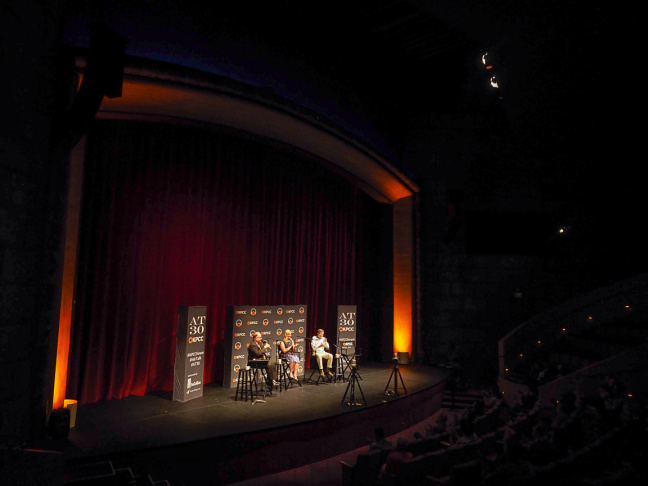 Not even the current state of Hollywood’s film business can match the drama of the minimum wage debate in Los Angeles. So what better place than North Hollywood's historic El Portal Theatre to stage multiple debates about the influential vote of the LA City Council to raise minimum wage in the city to $15 over the course of four years. 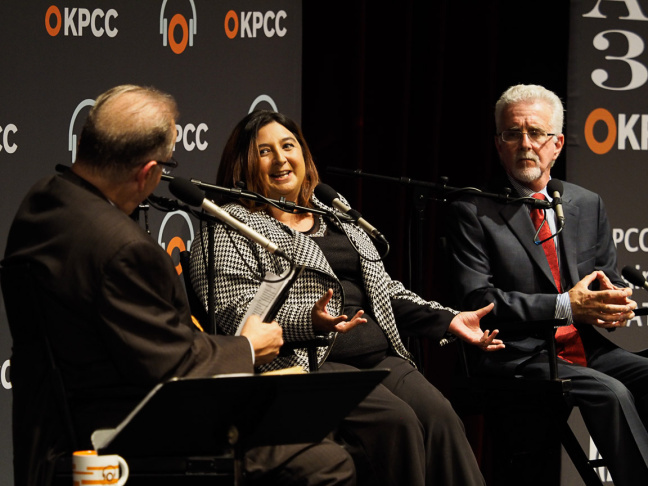 AirTalk's special event last night focused on the impact and implementation of a wage hike. 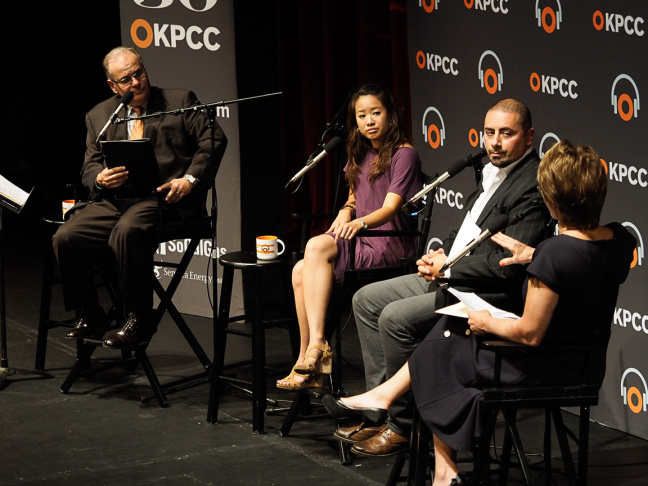 Industry leaders most affected by the pay boost, plus other brainiacs who gamed out the domino effect, discussed three key areas: impact on the restaurant industry; next steps for LA businesses, workers and government leaders; and how neighboring cities will respond to LA's bold experiment. Restaurant owners who employ tipped wait staff lobbied City Councilemembers to account for the fact that servers' wages often amount to more than $15 an hour when including gratuities, thereby making a wage hike unnecessary. Even so, workers' representatives say yearly incomes for wait staff are near the poverty line and should not be treated differently than other low-wage workers. "Seventy percent of hourly servers in restaurants earn less than $25,000 a year. This vote was passed to help those who need it most," argues Kathy Hoang, Director of Restaurant Opportunities Center of Los Angeles. Restaurateurs George Abou-Daoud and Michaela Mendelsohn say the wage hike places too big a burden on small businesses to solve the nation's income gap. "I want to keep my people, but to dramatically spike my prices to adjust for cost of labor just won't work," says Abou-Daoud who co-founded the Neighborhood Restaurant Coalition of LA. "We can't go higher on prices, so how do we get through this? We could cut back labor hours, but we really don't want to do that," explains Mendelsohn who owns El Pollo Loco franchises in Southern California. 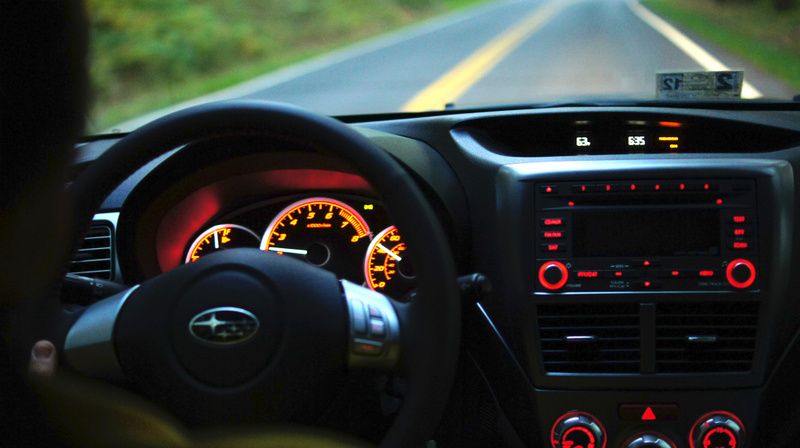 As for fast food restaurants, tensions exist between determining fair compensation for teenagers in their first jobs versus adults who need the service job as their primary, long-term employment. Some franchise owners say they will have to cut staff and replace cashiers with self-serve automated kiosks. In a Jetsons-like move, McDonald's is testing cashier-free locations throughout the U.S., including a location in Downtown LA. Is that the inevitable future? "Technology can't replace human interaction. We'll still be dependent on restaurant workers for their service,” says Hoang. We heard multiple perspectives on how the wage hike is impacting this massive, motley industry that is critical to the LA economy. The Raise the Wage campaign won an historic victory, what's next? 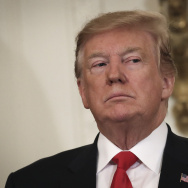 In the aftermath of the City Council's passage, national news called the wage hike a "bombshell" and some columnists characterized it as "an experiment" unleashed on one of the country's largest cities. Mayor Eric Garcetti trumpeted the historic law for “enabling working families in LA to lift themselves out of poverty and tying our minimum wage to the cost of living to make this justice last. LA as a whole will benefit from this boost: we have always prospered the most when everyone is able to spend money into our economy." “Studies and economists have told the council that this will add 6 billion dollars per year to L.A.’s economy,” says LA City Councilmember Paul Krekorian. In the meantime, business leaders complain mom & pop operations will go bankrupt. 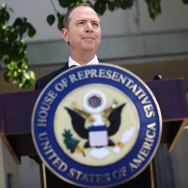 Since the passage, companies and union leaders have sought to tailor its implementation, including a stymied first attempt to exclude workers who negotiate labor agreements, which some perceived as a strategy to drive more unionization in the city. How are companies preparing for the hike? What effect will the wage hike have on the tumultuous housing market? 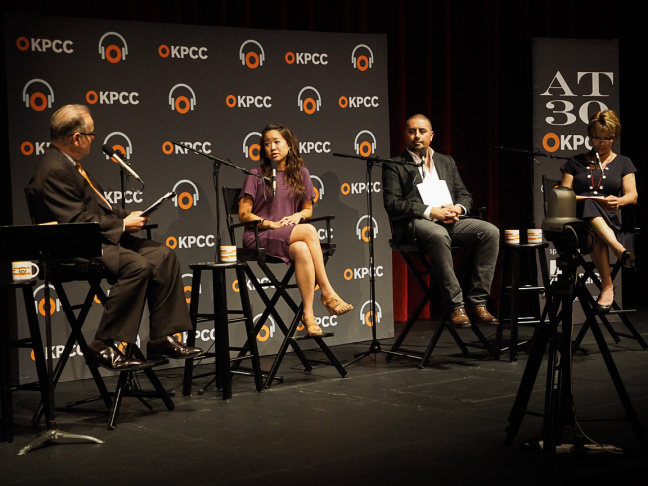 What will be the long-term effect on the types of industries, and types of workers, that can thrive in Los Angeles? Other cities in Southern California expected to adopt a higher wage soon are Santa Monica and West Hollywood. As well, LA County's Board of Supervisors is debating a wage hike that would be imposed on companies based in unincorporated parts of the county. 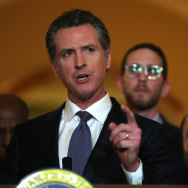 While the California Senate passed a bill proposing a statewide increase to $13 an hour, analysts say it faces an unlikely fate in the Assembly and with Governor Jerry Brown. Places like Torrance, El Segundo, and Glendale have made no moves to raise their minimum wage. Californians are dealing with a patchwork of policies that push and pull on workers and business owners. Some cities aim to lure LA businesses away from the new ordinance, while other cities worry their best workers will focus on LA jobs for the higher wage. How will your city respond?